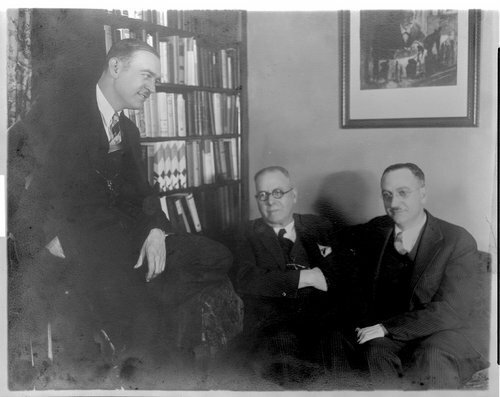 These photographs show the three Drs. Menninger at the Clinic. The Menninger Clinic is a facility for mental-health treatment, education, research, and prevention. It was started in 1919 in Topeka, Kansas, by Dr. Charles F. Menninger and his two sons, Karl and William. In 1925, the Menninger Sanitarium Corporation purchased a farmhouse on the west edge of Topeka, Kansas. The farmhouse became the inpatient clinic and the surrounding 20 acres were developed with buildings and gardens to become the "East Campus" of the Menninger Foundation. In 1982, the "West Campus", a much larger area, was developed west of Topeka, a residential scale community of 28 structures on a 350 acre hilltop campus. In 2003, the Menninger Foundation was moved to Houston, Texas.